Having been caught up in the works and doing last minute gifts for a number of occasions, especially Christmas, I am of the opinion that it is never to early to start making gifts for Christmas. I was hooked when I created this necklace. 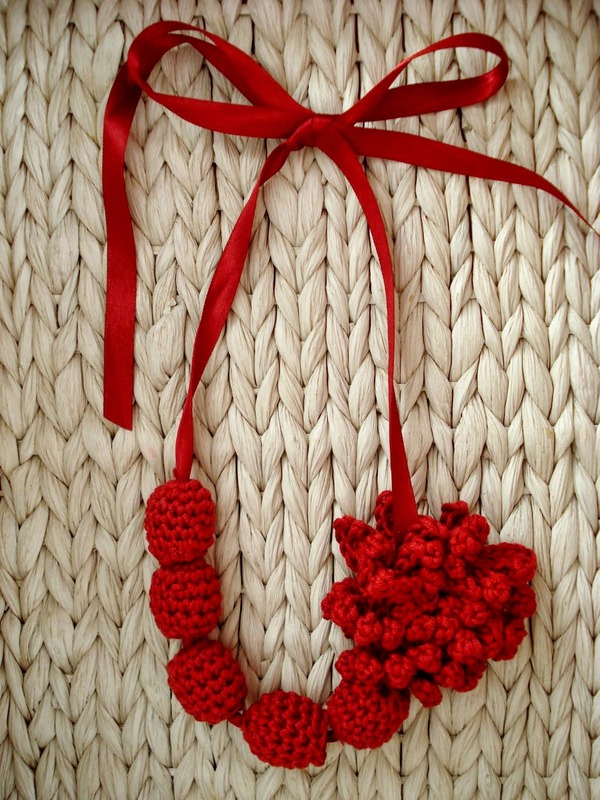 All you need is a crochet flower, some beads and a silk ribbon. You thread the ribbon through the beads and the flower and your gift is ready in an hour or two depending on your crochet skills. There are lots of great crochet flower tutorials around the web, try finding something here, and I also have a tute on how to crochet beads yourself. For the shown necklace I used elliptical wooden beads but the process is the same as shown in the tutorial. 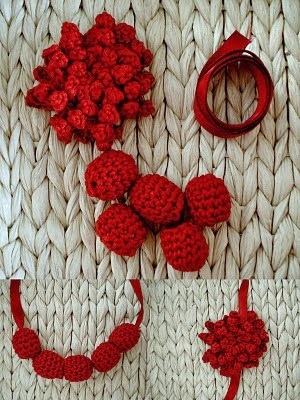 You can add other beads, bows, or maybe do this with fabric flowers, buttons and such. You just let your creativity flow. A whole week has passed since my last post and it seems like it was yesterday. Today is the day when everything I left unfinished is going to meet its end. So the little crocheted flowers turned into a scarf and today was its lucky day because I actually took photos with my little helper. It wasn't an easy job to be honest, because the yarn stubbornly reflected light and I put a lot of effort to capture its colors. Well, I am off now and you be well and have a great Saturday! Another gift "wrapping / holding" idea. Sewn clutches. 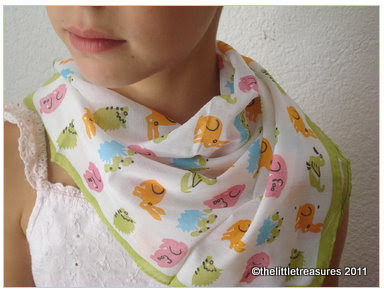 The project is ridiculously easy and quick and yet it is a sweet touch in sense of "wrapping". I send out my crochet necklaces in clutches usually made from remnants. If you remember I had a dress made out of this particular silk fabric this summer. The design of the clutch certainly complements the color choice of the necklaces. In line with the above, if the recipient likes it, she can use it for other purposes instead of using it as a "keeping /storing case". Although snow has appeared in certain parts of the world, autumn still officially reigns, that is until the winter solstice. 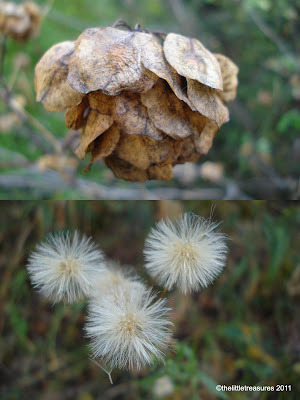 We have been enjoying some fair weather and watching nature change its attire. Inspired, I bought colorful yarn that captured all the colors of autumn. These flowers aspire to become a warm accessory. Stay tuned. This little tute came to mind after my last post regarding gift wrapping. 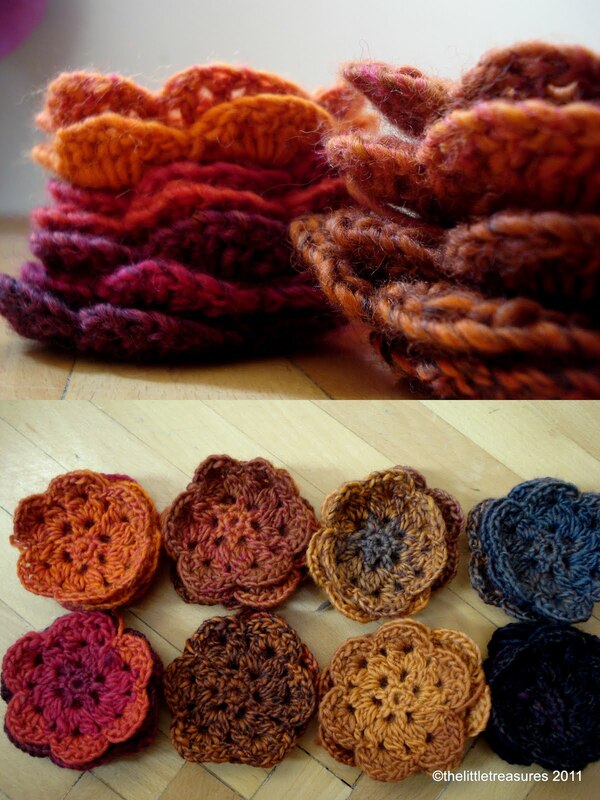 Last spring I played with paper and fabric (helping Jacob with a craft project) and got the idea of sewing a fabric piece over a sheet of paper to make wrapping for my crochet flowers. I tried it and it looked great, and I didn't miss to take pictures. 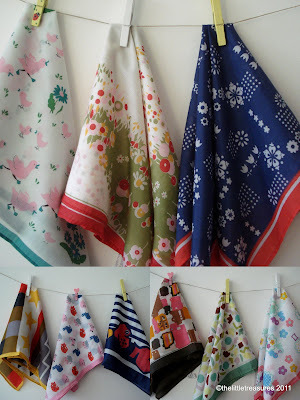 You need a fabric piece (scrap), a piece of paper and a sewing machine. For the wrapping I used an A4 copy paper and a lovely and quite thin cotton piece. I sewed the fabric onto the paper ( seam allowance included). and wrapped them nicely. I fastened the wrapping with a silk ribbon in the end. 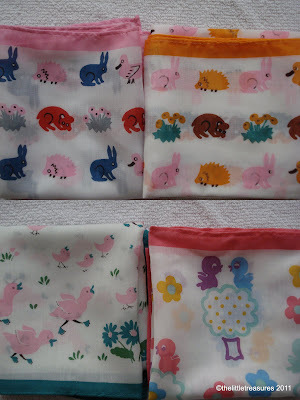 If you have any ideas about fabric covered paper, please share them with me! Once in a while I mention my vintage scarves but never show many of them. I have collected them fervently over the years and was quite brave to extend their use, hence these were created: a shirt, a balloon dress, a scarf, and some feathered friends. As you can see they are intended for children and the patterns are quite varied, colorful and attractive. I don't have a favourite because how could I pick just one from all these beauties? The reason for this post is actually this pin that set me thinking what would a top look like if I combine several of them. On Pinterest, I have a board named gift wrapping. It contains the most amazing ideas circulating the web and I love getting inspiration for my own gifts. In line with the above, I never throw away scraps of yarn because I know one day they will come in handy. And they do. The possibilities are endless. If you are interested my board is here. These babes are the reason for my absence this week. They had taken every free minute I had in the past weeks, and finally they are packed in a sturdy box and sent overseas. I like the palette the client chose especially the combination of the celery and sea green with baby pink and beige. Come tomorrow I will check up on my blog roll to see what you have been up to. Our family trek last weekend was wonderful. The weather was just right and we happily set off. We managed to make it quite exceptional and memorable for the children. 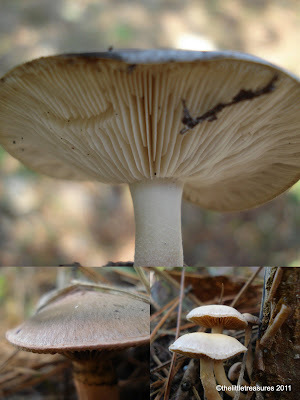 We studied nature, revised lessons learned in Science (with Eva) and collected material for future Science projects. We told "wood related"stories (Hansel and Grethel, Little Red Riding Hood) and my favourite part. Making up stories about elves. Whenever I see a big, old tree I immediately start describing the family of elves living deep down in the roots and elaborating the looks of their dwelling place. (Jacob loves that the most). I took a ton of pictures mostly involving nature. Sharing just bits. I hope you enjoy them! I knit this sweater 20 years ago. I can't believe myself how ancient that sounds and I still remember knitting it - just as if I did that yesterday. This sweater still resides in my wardrobe. I wear it but not that often, yet I don't have the heart to give it away. I made it with a huge help from a friend of my grandmother's who was masterful in deciphering knitting patterns. This one came from the Italian magazine "Rakam". At first I was intimidated by the intricate pattern which turned out to be quite easy once you got the hang of it.